Having done the first part, I got drawn in by that glorious orange. 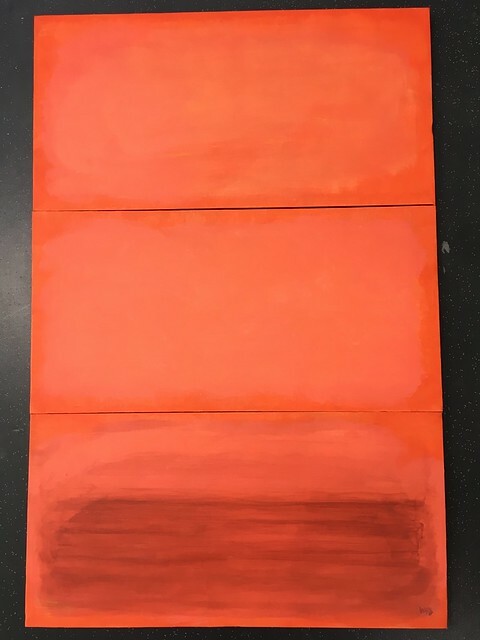 I had used a slightly reduced colour for the inner portion of each panel, compared to the pure colour round the edges (Sennelier Cadmium Red Orange Hue from their Abstract acrylic range), and the subtle difference set me in mind of Rothko’s colour field paintings. I’ve worked on it a bit more but you can’t see all the subtleties in the photo – it is just too vivid to easily capture. I might still end up doing the painting of Staithes harbour one of these days but I want to spend a bit of time with this on my wall.